Original purchased fare appears to have nothing to do with upgrade offer these days. From what I've seen, upgrade price largely varies with availability in the F buckets. It'd probably be more helpful if people provided the F bucket inventory rather than original fare. In this case, DL1254 is Z1, while DL2775 is D2, so DL2775 gets a significantly higher FCM price. Also, there's really no point in giving the mileage amount since it is simply the cash price minus the 7.5% US Excise tax at the rate of 1 CPM. Here's the magic formula to get mileage amount ( price / .01075 ). There were 4 seats available when I first looked at the flight. By the time I got to checking in there were only two left. I went ahead and used my sky pesos for the upgrade. There's only one seat left now and the upgrade list has 46 names on it. Thank you for that formula! I was wondering where the numbers come from! BWI - MSP - SAN 9 days out is $298.85 for both segments. Probably the best offer I've seen. 14 F seats available on MSP - SAN segment on a 739, only 1 seat taken on BWI - MSP on a 738. I might get at least one of those upgrades as a Plat. Got BWI - DTW - SAN all the way a few weeks ago. Edit: Did not go for it and ended up getting the upgrades on both segments. I was surprised by the BWI - MSP portion since I was #3 on the list and only 2 seats were available. Did not expect the seat update ticket to pop up. strickerj and dmarge18 like this. Does one get the 200% MQMs if buying up with miles and not cash? Question: If I check in at T-24 for the first leg of a two leg trip, am I just as likely to see a 'real' FCM offer for the second leg as well as the first, or do I need to do something to properly trigger an FCM offer at T-24 for the second leg? EDIT: Said first leg currently has a C+ to F FCM offer of $651 for DTW-JFK 23 days out with 3 open in F. lolz. When Ive bought up with miles, I got the MQM bonus. I dont think I got 200% though. I think it was 150% but I might have to check the math again. When I check into the first leg of a round trip flight, I always see the FC cabin blocked out for the return leg and no FCM offers are subsequently shown. I always have to call in to UG after the fact, although I have seen the option to UG at OLCI if I use the website. And, for whatever reason, FCM offers are always stupid expensive for me until I get within 7 or so days of my trip. My FCM offer for an April 4th SEA-DTW leg is currently showing $638 but typically drops to $375 the week of. Still not a great deal though. Interesting. When I said two-leg, I suppose I should have said 4. My outbound is two legs with a 4 hour layover. I am always curious as to if/when I would see a FCM offer that would qualify as a 'check-in special' in terms of value, but it sounds like you're seeing this level of 'deal' within 7 days. Interesting. I'll keep an eye on it. Wow, actually got a good one. ATL>SAT Friday night, 5 open seats in First, upgrade is $106. 2:40 min flight. As a PM I would assume I'll be likely upgraded with that rate and availability so will pass. Seatmap availability does not need to have any correlation with Fare bucket availability. In this case, DL4933 on 3/27 is J9 C9 D0 I0 Z0. So again, price seems to correlate with the bucket availability, not the number of open seats. As you can see there is only availability in the pricey J and C buckets, and the cheaper D/I/Z buckets are all zero'd out. Note that BCD Travel has a free availability checker tool. 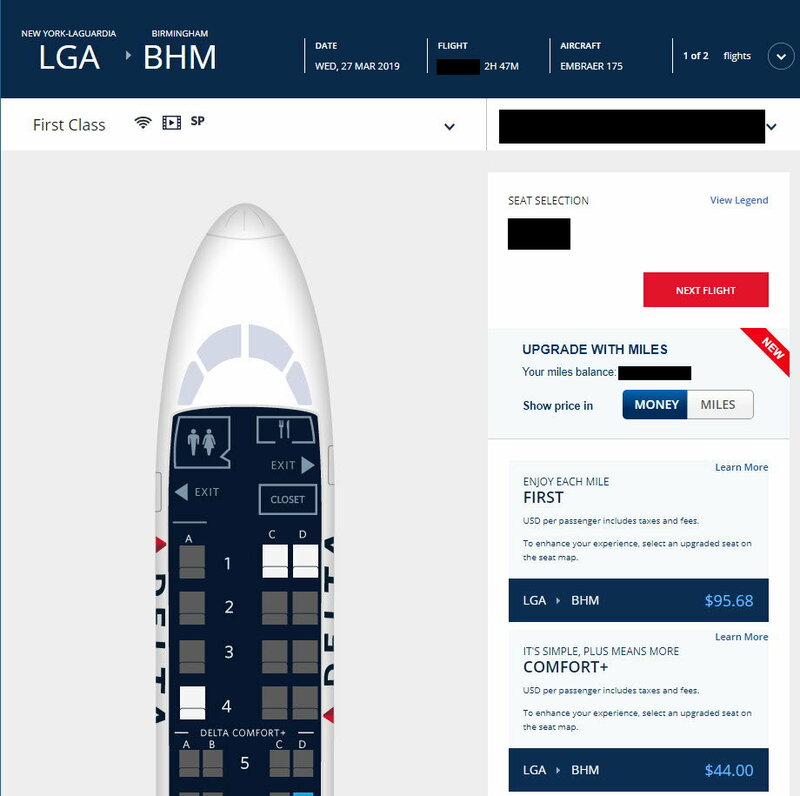 Now in the UG window for flights on weekend (SAT-ATL-MLB), but no upgrades have cleared yet. Nearly $1400 to buy-up for both legs. 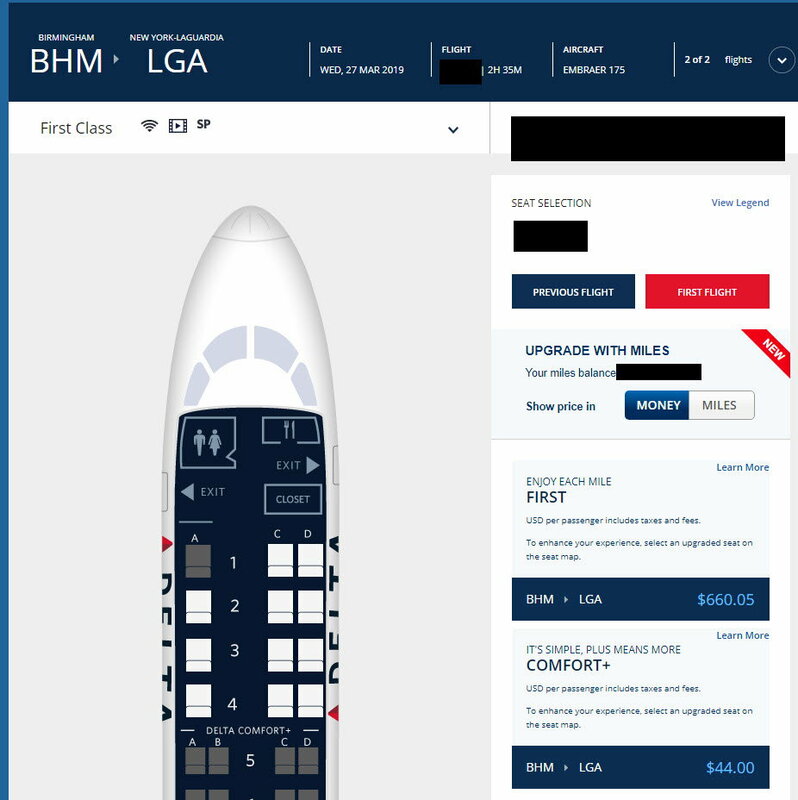 Never seen the upgrade with miles option on any FCM. Interesting!